WASHINGTON — Defense attorneys for the 27-year-old D.C. police officer who shot and killed an unarmed motorcyclist following a 25-block chase through the District in 2016 squared off against lawyers from the D.C. Office of Attorney General at his disciplinary hearing Wednesday. Lawyers for Officer Brian Trainer say he feared for his life when Terrence Sterling, 31, turned the wheel of his motorcycle into the passenger door of a police cruiser, pinning Trainer’s legs. “Mr. Sterling ran every single red light from 18th and Columbia Road in Adams Morgan to 3rd and M streets. He was going more than 100 miles an hour, driving on the wrong side of the road. At one point he almost stuck another police officer,” said defense attorney James Pressler. Lawyers from the Office of Attorney General countered that Trainer and his partner ignored a supervisor’s order to not chase Sterling. “No one needs to be running code down U Street after this guy,” the supervisor said, according to police radio transmissions played by the prosecution. Zayd Rahman, the Internal Affairs agent who determined the shooting was unjustified, told the panel that Trainer was within his rights to unholster his gun, but that it reduced the options he had for apprehending Sterling without shooting him. 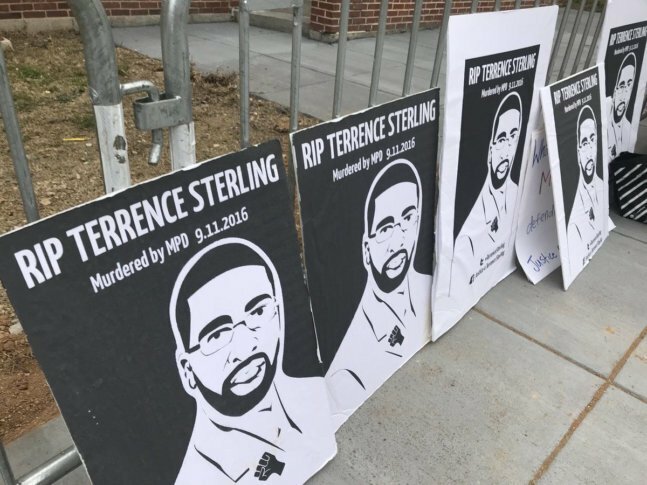 The hearing comes after the D.C. Police Use of Force Review Board found that Trainer violated department policy in Sterling’s shooting last September. The board ruled the shooting unjustified and recommended Trainer be fired. In a separate investigation, D.C. prosecutors determined there was not enough evidence to prove that Trainer violated Sterling’s rights. Sterling’s family reached a $3.5 million settlement with the District in February — the largest the city has ever paid involving the death of a citizen by police. His death sparked a series of protests from several organizations, including Black Lives Matter, calling for more police transparency. Sterling was riding on a motorcycle westbound on U Street around 4:20 a.m. on Sept. 11, 2016 when he drove along side a police cruiser occupied by Trainer and his partner, prosecutors said. Sterling pulled in front of the police vehicle, which was being driven by Trainer’s partner, and sped through a red light. A chase ensued, covering 25 city blocks, federal officials said. Sterling drove 100 mph or more, while narrowly missing pedestrians and cars, police said. Trainer said he fired two rounds at Sterling after the motorcyclist crashed into the passenger-side door of the police cruiser he was in. Trainer was the only officer on the scene who was equipped with a body camera, but he did not turn it on until after the shooting. This prompted protests and led D.C. police to release the footage. Trainer was a four-year member of the D.C. police force.